Hello. As those who've read here for a while know, earlier this year, the good folk at Jeff Street Baptist Community at Liberty (my beloved church) published a book of writings, stories, poems, etc from our members. We had a big release party this summer, dedicated the book to our dear pastor and had books available for those who wished to purchase one. I have now finally gotten around to setting up the account so that you can order these Jeff Street books online! We actually published two books. 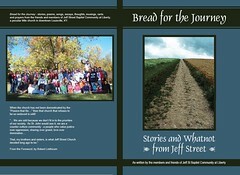 The first is Bread for the Journey: Stories and Whatnot from Jeff Street. This is our book of stories and, well, whatnot. The second book is Steve P. Holcombe, the Converted Gambler: His Life and Work. This book was written by Alexander Gross and published by the Courier Journal Press in 1880. It is the fascinating story of the fella who founded the Union Gospel Mission, the church from which Jeff Street sprang. Both of these books are available online at our Jeff Street "store." When we received permission to republish the Steve Holcombe book, we had to promise to only charge the actual publishing costs. So, if you go to order that story, you will see that it is cheaper (free! if you choose to download it!) and that is why. All profits from the Jeff Street book go directly to the work of the church. If you are interested in either book, please check them out. Throughout Jeff Street’s history, we’ve never been a large church - mostly averaging fewer than 100 in attendance on any given Sunday. We’ve never been a rich church, being made up of the homeless, the mentally ill, the working poor, and – moreso in these last 20 years – teachers, mental health workers, social workers, labor and justice organizers, and those working in environmental fields: sort of the seamy side of the working class. What we have been is there. We’ve consistently been there, on the frontlines of Louisville’s poverty issues, homeless concerns, and justice and peace issues. What a blessed history to remember! What a future yet to tell!